Jessica Springsteen and Volage du Val Henry. Photo by Jump Media. Wellington, FL – U.S. rider Jessica Springsteen was named the Martha Jolicoeur Leading Lady Rider Award winner on Saturday, February 23, during CSI5* week, the seventh week of competition at the 12-week Winter Equestrian Festival (WEF) in Wellington, FL. Springsteen, 27, piloted Volage du Val Henry, a 10-year-old Selle Français mare owned by Stone Hill Farm, to sixth place in the $134,000 CSI5* Equinimity WEF Challenge Cup Round 7 qualifier earlier in the week, sealing her fate for an appearance in Saturday evening’s big ticket event. She again earned a top-10 placing in the $391,000 CSI5* Palm Beach Equine Clinic Grand Prix, this time riding RMF Zecilie, a 12-year-old Holsteiner mare owned by Rushy Marsh Farm. The Martha Jolicoeur Overall Leading Lady Rider Award will be presented to the female rider who accumulates the most points throughout the 12-week Winter Equestrian Festival, now in its second half of the season. So far this year, Erynn Ballard, Laura Chapot, Margie Engle, Tiffany Foster, Lauren Hough, and Beezie Madden have earned the weekly honor and have set their sights on claiming the overall title. Left to right: Beezie Madden battled the weather to accept her Martha Jolicoeur Leading Lady Rider title from Martha Jolicoeur and Dr. Stephen Norton. Photo by Jump Media. Wellington, FL – Reigning FEI World Cup™ Final champion Beezie Madden was awarded the Martha Jolicoeur Leading Lady Rider title following Saturday Night Lights competition on January 26 during Week 3 of the 12-week Winter Equestrian Festival (WEF) running through March 31, 2019, in Wellington, FL. Lexington, Kentucky – November 20, 2011 – Part of the sizzle of a breathtaking Saturday night of world-class show jumping at this year’s Alltech National Horse Show in Lexington, Kentucky, was the awarding of the Martha Jolicoeur Leading Lady Rider title. The 2011 title was awarded to one of the nation’s fastest rising stars, Jessica Springsteen of Colts Neck, New Jersey. 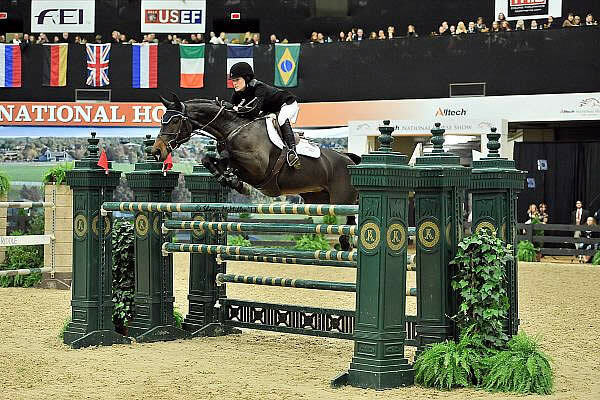 The Alltech National Horse Show concluded on Sunday, November 6, after a highly successful five day inaugural run at the Alltech Arena at the world-renowned Kentucky Horse Park in Lexington, Kentucky, site of last year’s Alltech FEI World Equestrian Games. Jolicoeur’s award was presented on Saturday night, following the victory gallop for the $250,000 Alltech National Horse Show Grand Prix. Richard Spooner of California, riding Cristallo, raced to the primetime win.